Riding through trees in fresh powder or seeing elk and deer while touring though the backcountry is exhilarating, but being caught in an avalanche is terrifying. More than 150 people die in avalanches worldwide every year, and the number is increasing. Avoiding an avalanche is the best way to survive. Before you set out, check snow and weather conditions and avalanche danger. 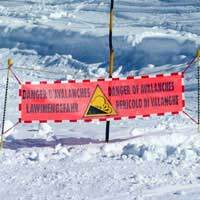 America and Europe have similar avalanche danger scales. LOW danger means the snowpack is generally stable, with only isolated areas of instability. Backcountry travel is fairly safe, though low does not mean 'No Danger'. MODERATE danger means there are some areas of instability. Natural avalanches are unlikely, but human-triggered avalanches are possible. Backcountry travelers should proceed with caution. CONSIDERABLE danger means unstable snowpack is probable. Natural and human-triggered avalanches are likely. Proceed with extreme caution. HIGH avalanche danger means unstable areas are highly likely on various slopes and aspects, with a high chance of natural and human triggers. Backcountry travelers should avoid steep and wind-loaded slopes. EXTREME danger means backcountry travelers should not go out. But if you insist, avoid any steep terrain or known avalanche areas. Snowpack layers are extremely unstable and humans are certain to trigger avalanches, as are natural causes. Be sure that everyone in your group has avalanche safety knowledge, knows how to use their beacons and has a shovel and probe. Listen to your partners, if someone is unsure or “has a bad feeling,” reconsider. Do not go into the backcountry during avalanche danger by your self. Avalanches are common and only require a mass of snow and a slope to slide. Knowing the three parts of an avalanche will help you avoid being caught in any of them. The most volatile area of a slope, the starting zone, is where unstable snow fractures from its surroundings. Skiers who trigger a slide at this point can be caught, and burry their friends in the avalanche track, the path or channel the avalanche follows downhill. Often the most popular backcountry runs are chutes created by avalanches. If you see a crack above you, ski straight out horizontally into deep trees. The runout zone is where the avalanche finally comes to a stop, piling snow and debris like cement. Terrain traps like rocks and trees can bury a person further up the avalanche track, however, most victims are buried in the deposition zone. If you are caught, and cannot ski out, release your gear to avoid twisted limbs and hopefully leave a trail for your rescuers. Use swimming motions to try to stay near the top and keep your hands near your face to create an air hole and then dig “up” once the snow has stopped. Looking into an AvaLung, avalanche ball and/or ABS Airbag can increase survival. Remember in many cases transceivers find only bodies, so don’t get caught in the first place! Many factors affect the likelihood of an avalanche. Understanding how weather, including wind, temperature and precipitation, affects snow pack increases the chances you will make the right decisions. For example, even one foot of snow can produce avalanches that are often large enough to block highways or bury houses. Wind can deposit scoured snow from the windward side, to the leeward side of a mountain, and changes in temperature can cause melting within the snowpack weakening the upper layers. Shooting cracks and small slab slides are signs of unstable snowpack. Listen for hollow or whumping sounds underfoot. Dig a snow-pit, or a Rutschblock test, on every slope or aspect to determine the snow conditions. The recipe for avalanches varies so constantly reevaluate your opinion of the snow safety. Recognizing terrain features such as aspect, steepness, cliffs and vegetation is also important. A cornice at the top of a mountain is a telltale sign of wind scouring. In the Northern Hemisphere, storms generally deposit snow on the northeast, east and southeast facing aspects, combined with a slope between 30 and 45 degrees you have a recipe for an avalanche. However, avalanches can occur on any slope given the right conditions. Skiing above cliffs or crossing an avalanche chute on the valley floor can be deadly if a slope slides. Trees can create some protection, but single trees or rocks can also weaken the snowpack. Be aware of your surroundings; know what creates avalanche danger. Keep terrain traps in mind and your proximity to a potential slide. Moreover, know your escape routes. Avalanche related deaths have been recorded in every month of the year. Take an avalanche safety course before heading out. Look for courses in your area or at the resort you’ll be visiting. Being smart and safe will cultivate a great day and a great future of hiking and skiing.